Prestigio Multiphone 5454 Duo LTE Gets A Price Cut! Down To 5899 Pesos! Home / mobile / news / prestigio / prestigio multiphone 5454 duo lte / prestigio multiphone 5454 duo lte price cut / prestigio multiphone 5454 duo lte specs / Prestigio Multiphone 5454 Duo LTE Gets A Price Cut! Down To 5899 Pesos! Great news guys! 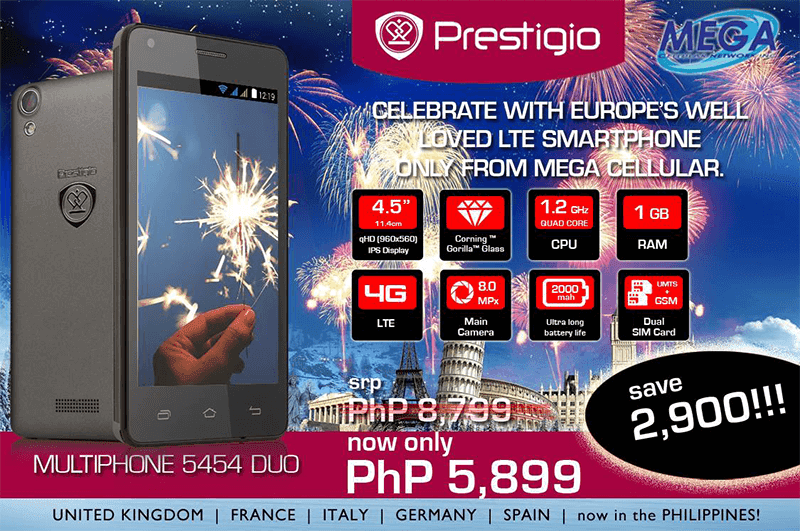 Prestigio Philippines just announced that the Multiphone 5454 Duo LTE gets a price cut! From the quite hefty SRP of 8,799 Pesos, Prestigio decided to reduce the price to a more reasonable one at just 5,899 Pesos! In case you missed it, this handset is one of those capable Snapdragon 410 devices with decent specs for your basic task. It boast 1 GB of RAM, 8 GB ROM, 8 MP rear camera, 2 MP selfie camera and goes with the usual 200 GB cloud storage exclusive for Prestigio phones. A better deal now right?